Masters of the approachable family game, Gamewright delivers another multi-age filler game in Qwingo, a roll & write game designed by Heinz Meister. Read on to find out if we think Qwingo ranks highly, or if it makes us roll our eyes! The rules of Qwingo are incredibly simple, and the box contains all of the supplies you need. Each player takes a scoring sheet and a pencil (provided!). 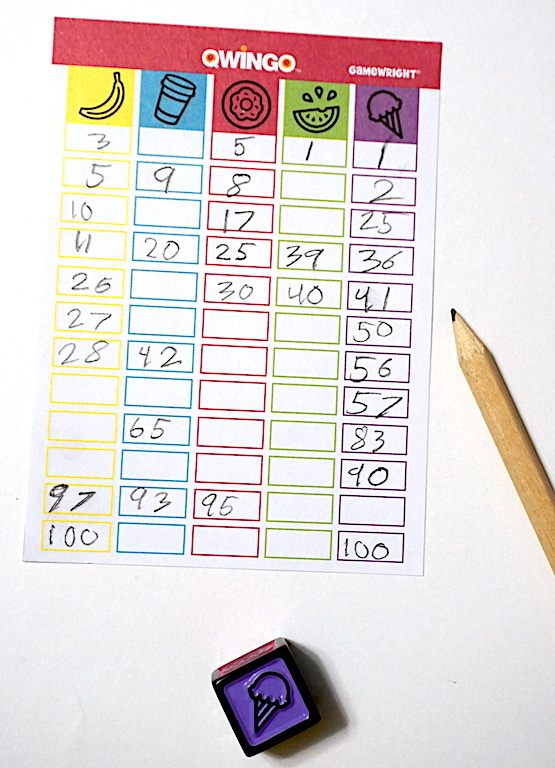 To “seed” the score sheets, players write a multiple of ten in each of the five columns on the sheet. These numbers must be unique, and be between ten and fifty (10, 20, 30, 40, 50). The columns correspond with both colors and different sweet treats. This is a nice subtle accessibility feature for those who may be colorblind. On their turn players call out a number between one and one hundred then roll the included six-sided die. Five of the sides on the die correspond with the colors and the sixth side is a wild. Players write the called number down on their score sheet in the appropriate column. The numbers in each column must be in numerical order. If there is no room for a given number in the assigned column, the player can’t write anything down! The winner is the first player who completes a column. Qwingo gets its name by taking another roll-and-write title localized by Gamewright called Qwixx, and combining it with Bingo. Qwingo definitely has a lot more in common with Qwixx. In fact, the only similarity I found between Qwingo and Bingo is the calling out of numbers on each turn. We’ve talked about games with similar number-ranking mechanics before. (In fact, we reviewed a similar game called Digity Do earlier this year). 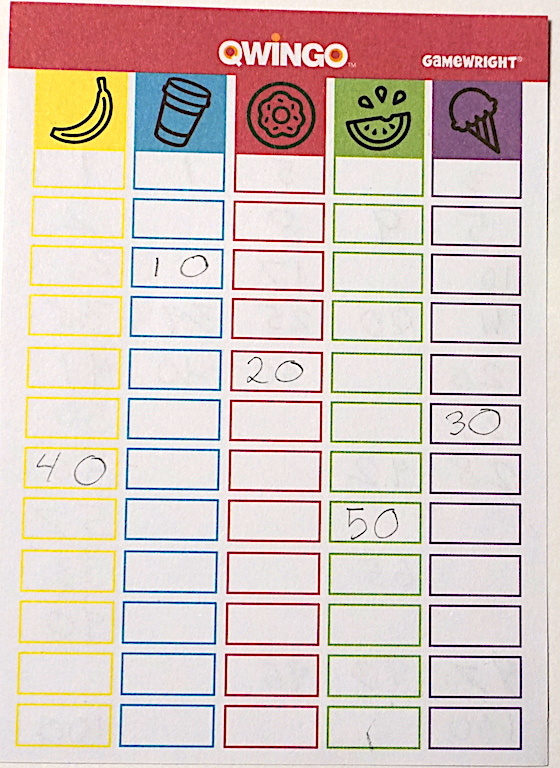 These kinds of games are great games to play with multiple ages because the number sequencing is a critical skill that kids learn early, but estimation is a skill that all of us can improve. Qwingo really hits the sweet spot on the restaurant table. Unlike other great restaurant games like Story Cubes, it’s really easy to keep track of a single die that passes from player to player. It’s also a great game to pick up and put down, so pausing to eat and wrapping the game up at the end of the meal is no problem either. Finally, with the box including everything you need down to the pencils, it’s incredibly convenient to throw in a bag. The box is just about the size of a three by five card and about an inch thick. At around just twelve dollars, Qwingo is a tough package to say no to. The game is easy to understand, quick to pick up and put down, and fits in a nice small package. You could easily make the argument that you only need a regular six-sided die and a piece of paper to play the same game, and you would be right. However, with Qwingo being so inexpensive and literally containing everything you need right in the box, it’s a great way to go. We’re getting dangerously close to stocking-stuffer season, and this is going to be high on our recommendations list. Head over to Amazon and get a head start on playing Qwingo today! 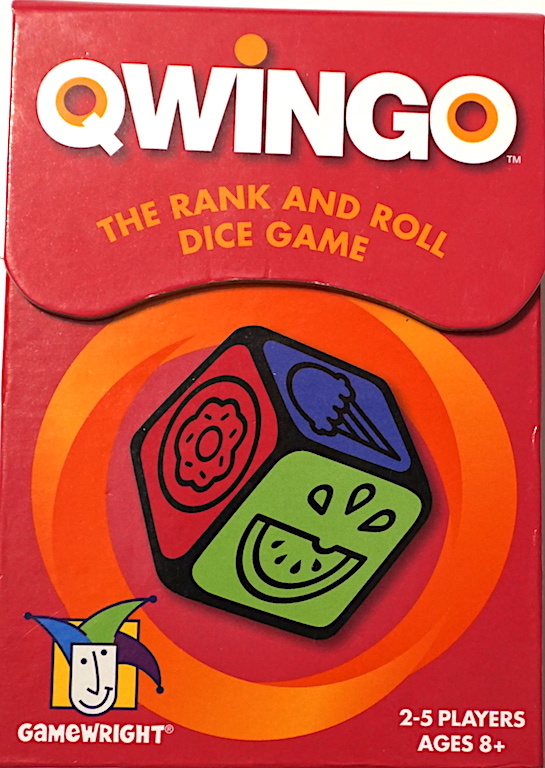 Gamewright provided The Family Gamers with a copy of Qwingo for review.